These Red Velvet Cupcakes are by far the best cupcakes I have ever had! Moist, flavorful, and decadent don't even begin to describe how incredible they are! I'm starting to understand why red velvet pastries are so popular. I don't mean the "die it bright red and call it red velvet" stuff that you can get, for example, at a gas station or the like (I've gotten a "red velvet" doughnut from one of these places and it was flavorless outside of my tasting large quantities of sugar). I'm talking about the wonderful flavors that the buttermilk, dark cocoa, vanilla, and cream cheese bring to the high quality dessert. I greatly enjoy the fact that one has to think about what flavor it is when eating it, because each bite draws out the contrasting flavors of chocolate and vanilla, while still complimenting each other so well. I don't know about you, but I would be perfectly happy eating a well made red velvet dessert all throughout the year, regardless of the fact that it is mostly marketed towards Valentine's Day with its red and white (and sometimes pink decoration) colors, generally making red velvet a seasonal item. Here I am going on and on about not wanting them just for Valentine's Day, and yet, I still made these for Valentine's Day (Yeah, I know... I'm still a bit behind. I promise, this is my last "catch up" post for now). I mean, why not, though? Perfect time for them! And let me tell you-- they went like hotcakes! I made a much larger batch than usual the day before Valentine's Day thinking it would be enough for anyone that wanted to buy some. Nope, clearly I was wrong. By lunchtime on Valentine's Day, they were completely gone. Great that they sold so well, bad that I ran out! Now that I've told you how they should be made and how well they sold, I suppose I should tell you about the wonderful cupcakes you're looking at throughout this post. Obviously, they're red velvet cupcakes (and maybe not so obviously) topped with the most amazing cream cheese icing. And to give it the touch it needed for the festive occasion, I used white chocolate candy melts (in pink) to hand draw the designs that were set on top of each cupcake. All that is shown in the pictures here on the website is the "Love" design. However, some were topped with a heart instead. 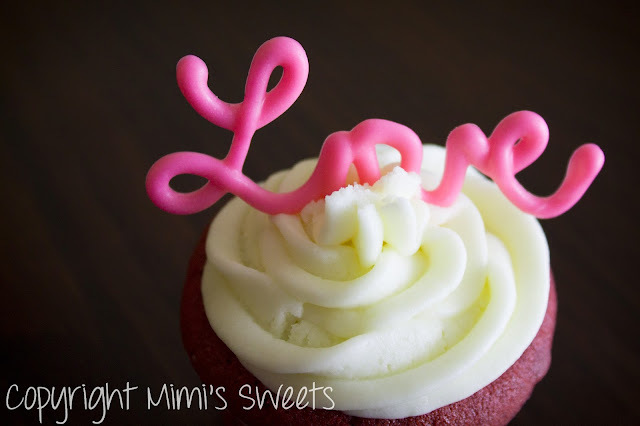 To see those, head on over to Mimi's Sweets' Facebook Page! 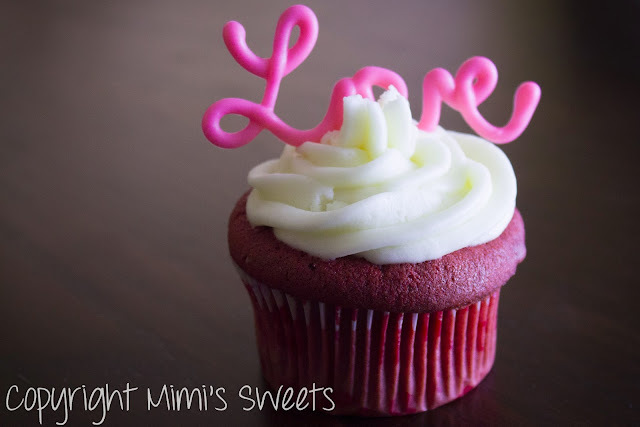 Though my red velvet items will technically be seasonal, if you find yourself in the Charlotte, NC area and want (or need) some of these fabulous cupcakes, a cake, or my highly sought after Red Velvet Cheesecake, no matter what the occasion, I would be more than happy to make them special just for you. 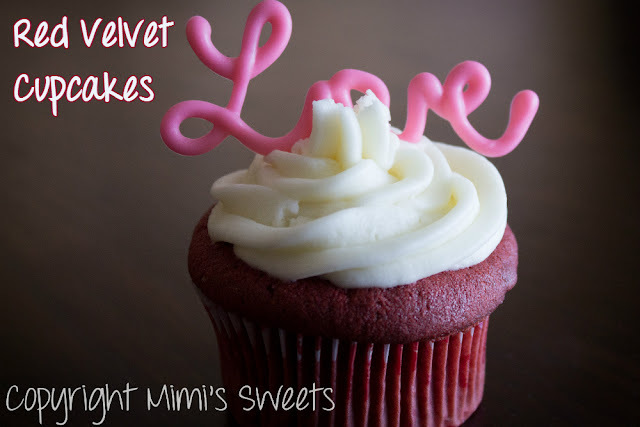 Even if you aren't in my area and find yourself with a craving for something red velvet, you're in luck! If you live in the US, you can special order my Red Velvet Scones, Red Velvet Cookies, or Red Velvet Cheesecake Brownies, and they will be shipped directly to your door! Don't make yourself suffer and crave these decadent red velvet delights for almost another year... Order yours today! Thanks for stopping by... And we hope to be doing business with you soon!